We come to the third time Balak King of Moab implores Balaam to curse Israel. Predictably, God places a word of blessing for Israel in Balaam’s mouth, not the sentence of demise Balak is hoping to hear. Let’s work our way through this seven verse passage. In verses three and four we observe Balaam referring to himself in the third person, why? It seems Balaam is being personally affected each time he hears himself repeat the words God has spoken in his ear. I’m sure it felt like a third person experience for Balaam as he was very literally being used by God as a mouthpiece. Balaam let’s us know he had experienced a paradigm shift. His perspective has been changed. The way he looks at things has been radically affected. Balaam contrasted his previous and later perspectives when he said, “my eyes have been open”. It’s as if he was saying, I’ve been walking around like a blind man, but now God has opened my eyes. What do I see now with my newly opened eyes? The answer is found in verse 5. Jamieson, Robert, A. R. Fausset, and David Brown. Commentary Critical and Explanatory on the Whole Bible. Vol. 1. Oak Harbor, WA: Logos Research Systems, Inc., 1997. Print. 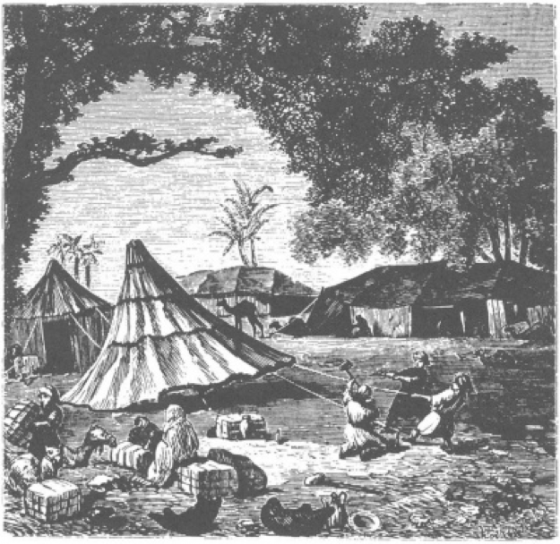 The tents would not have been of the modern day rectangular type we are familiar with, but rather like the round tents of the nomadic people called bedouins. Exposure to the Word of God most certainly changes a person’s perspective. As if our eyes are suddenly opened, we can see a people God has His hand on in a different light. We can see them as beautiful, when we previously would have considered them worthy of a curse, not a blessing. How do you view the people around you? When you consider the nation of Israel, for example, how do you see them? Do you see them as a beautiful people blessed by God? 1 Reply to "Balaam’s Third Prophecy - Part 1"
I thought as reading this how much of a transformation God can make in us Christians if he can make such a transformation in such a misguided person such as Balaam.